Lower your score with the Perfect Pendulum. The quickest way to lower you score is to improve your putting and chipping and the Perfect Pendulum is the best golf training aid designed to improve both. With the Perfect Pendulum you learn a pendulum putting stroke and the proper chipping motion. This short video shows how the Perfect Pendulum can be used to improve your putting and chipping. 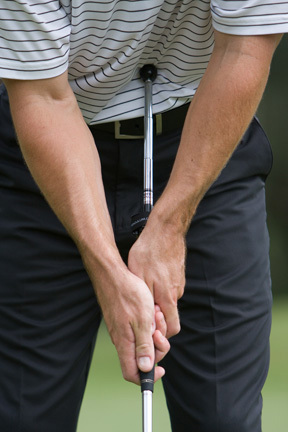 Right or left, short or tall, beginner to tour pro, the Perfect Pendulum can help anyone lower their score. It fits any golf grip except jumbo size and includes instructions and a free drawstring carry pouch.